Ideal for any event decoration. Spray Roses are smaller than standard roses and have various little blossoms per stem. Petite and wonderful, spray roses for the most part have 3 to 5 heads and are flawless as a highlight blossom or bundled together to make a bigger bunch. Unimaginably sweet and accessible in a horde of hues, one essentially can’t turn out badly with these blossoms. 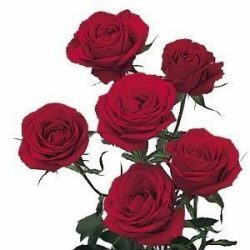 Buy wholesale spray roses in bulk to make floral decorations for a wedding or special occasion.